What follows is a summary of the story concerning the events that occurred at the time of Musa عليه السلام; the victory Allah provided to His messenger and the destruction of the Pharoah. It is summarised from a khutba delivered by Shaikh Mohammad bin Salih al-Uthaymeen. “In this month of Muharram was the salvation of Musa عليه السلام and his people from Pharoah and his army. Allah سبحانه و تعالى had sent him with clear evidences and proofs upon his prophethood, yet the Pharoah was arrogant and haughty and claimed, “I am your lord, most high” [An-Naazi’aat:24]. Musa عليه السلام came to him with great signs and called him to tawhid, to the tawhid of the Creator of the Heavens and the Earth yet Pharoah said in arrogance, “And what is the Lord of the ‘Alamin (mankind, jinns and all that exists)?”[Ash-Shu’ara:23]. Musa عليه السلام responded, “Lord of the heavens and the earth, and all that is between them, if you seek to be convinced with certainty.”[Ash-Shu’ara:24]. And so Pharoah mocked and belittled this statement of Musa عليه السلام by saying to those around, “Do you not hear (what he says)?” [Ash-Shu’ara:25]. So Musa عليه السلام reminded them and admonished them further and said, “Your Lord and the Lord of your ancient fathers!” [Ash-Shu’ara:26]. Left speechless Pharoah then replied with a false claim, a lie, “Verily, your Messenger who has been sent to you is a madman!” [Ash-Shu’ara:27]. He later continued to threaten Musa عليه السلام and said, “If you choose an ilah (god) other than me, I will certainly put you among the prisoners.” [Ash-Shu’ara:29]. Indicating that he had many other prisoners already to frighten Musa عليه السلام into silence. And when Pharoah came with his magicians Musa عليه السلام admonished them and said, “Woe unto you! Invent not a lie against Allah, lest He should destroy you completely by a torment. And surely, he who invents a lie (against Allah) will fail miserably.”[At-Taha: 61]. “Musa (Moses) said to them: “Throw what you are going to throw!” So they threw their ropes and their sticks, and said: “By the might of Fir’aun (Pharaoh), it is we who will certainly win!” Then Musa (Moses) threw his stick, and behold, it swallowed up all the falsehoods which they showed!” [Ash-Shu’ara: 43-45] And so the magicians repented and believed, “And the sorcerers fell down prostrate. Saying: “We believe in the Lord of the ‘Alamin (mankind, jinns and all that exists)” [Ash-Shu’ara: 46-47]. Pharoah continued upon his way and Allah stated, “So when they angered Us, We punished them, and drowned them all. And We made them a precedent (as a lesson for those coming after them), and an example to later generations” [Az-Zukhruf: 55-56]. Then Allah commanded Musa عليه السلام, “And indeed We inspired Musa (Moses) (saying): “Travel by night with Ibadi (My slaves) and strike a dry path for them in the sea, fearing neither to be overtaken [by Fir’aun (Pharaoh)] nor being afraid (of drowning in the sea).”[At-Taha: 77]. And so Allah saved Musa عليه السلامand destroyed Pharoah. 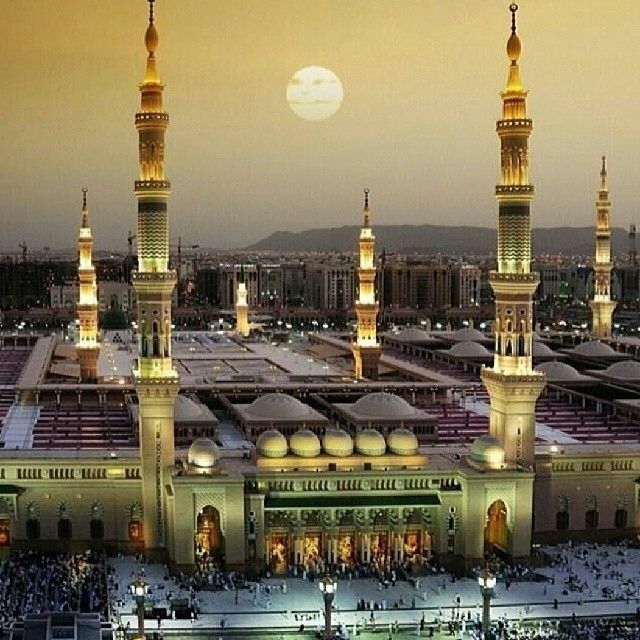 It is for this reason when the Prophet صلى الله عليه و سلم entered Madinah and found the jews to be fasting on the 10th of Muharram he asked regarding that and they replied, “It is the day Allah saved Musa and his people from their enemy [Pharoah] and so Musa fasted this day”, so the prophet صلى الله عليه و سلم replied, “I am more deserving of Musa than you” and so he fasted and commanded the people to fast. Similarly the prophet صلى الله عليه و سلم stated if he lived till the upcoming year he would fast the 9th aswell to oppose the others who were fasting only the 10th as he found them. Hence it is sunnah to fast the 9th and 10th of Muharram. Regarding the reward of fasting the day the prophet صلى الله عليه و سلم stated, “It expiates the previous year of sins” [minor sins]. 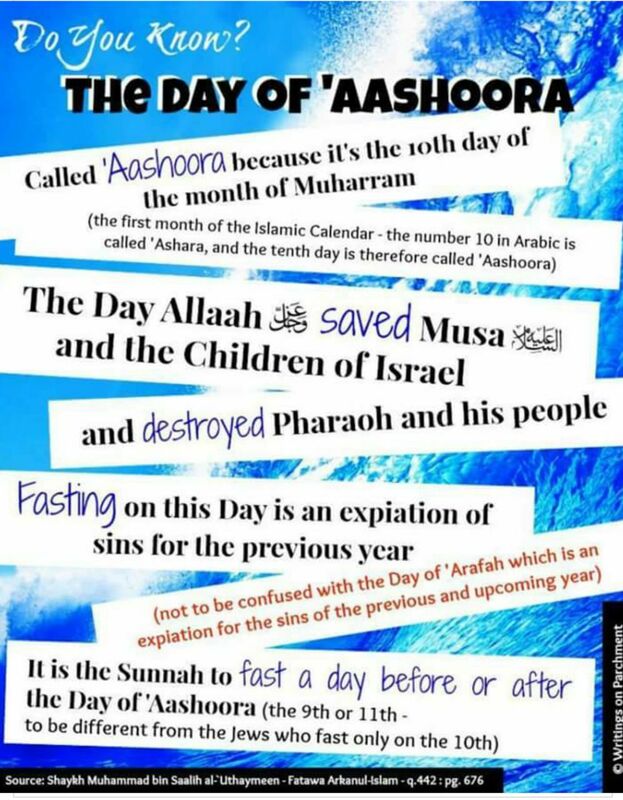 This should not be confused with the day of ‘Arafah that expiates the previous year and upcoming year. 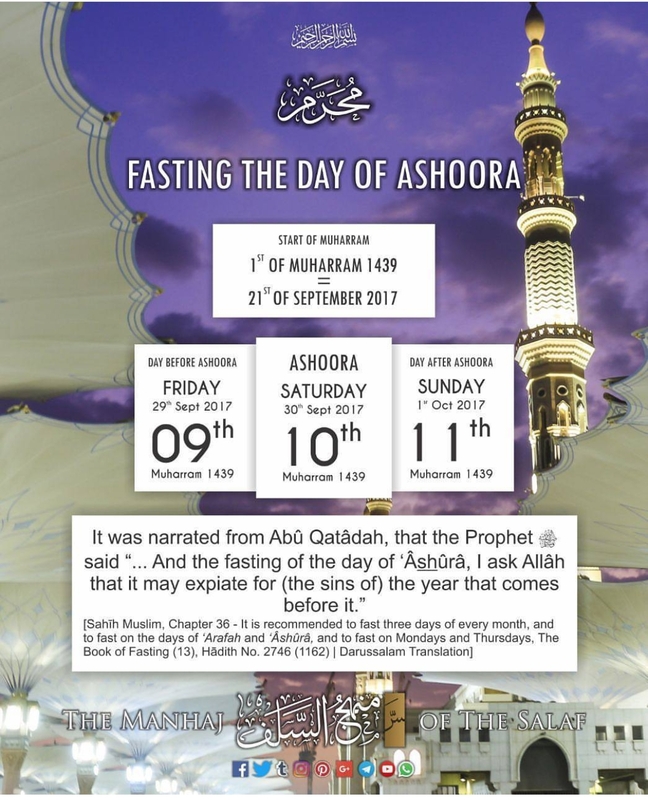 It is also recommended to fast the day preceding `Ashura’ which is the ninth day of the month Al-Muharram as it is mentioned in the hadith of Ibn `Abbâs رضي الله عنهما who said: “When the Messenger of Allah observed fast on the day of `Ashura, and ordered Muslims to fast on it, they said to him: “O Messenger of Allah! This is a day which both the Jews and the Christians venerate. Upon this, the Messenger of Allah said, “When it is the next year, Allah willing, we would observe fast on the ninth day (of Al-Muharram besides that day)”. But, it was not until the next year that the Messenger of Allah صلَّى الله عليه وسلَّم had died”(Reported by Muslim), and in another narration: “If I survive to the coming year, I would surely observe fast on the ninth (day of Al-Muharram)”(Reported by Muslim). The meaning of Allah’s saying: And remember Allâh during the appointed Days. Q: O respected Sheikh! Would you please tell me the meaning of Allah’s saying: But whosoever hastens to leave in two days, there is no sin on him and whosoever stays on, there is no sin on him? A: This Glorious Ayah (Qur’anic verse) relates to the Days of Tashriq (11th, 12th and 13th of Dhul-Hijjah), Al-Nafr Al-Awwal (leaving Mina after throwing the stones in the 12th of Dhul-Hijjah), and Al-Nafr Al-Thani (leaving Mina after stoning on the 13th of Dhul-Hijjah). Allah (Glorified be He) says: And remember Allâh during the appointed Days. i.e. the Days of Tashriq which does not include the Day of `Eid-ul-Adha (the Festival of the Sacrifice). And remember Allâh during the appointed Days. The Day of `Eid-ul-Adha is the tenth day of Dhul-Hijjah. Muslims are commanded to pronounce Dhikr (Remembrance of Allah) during the first ten days of Dhul-Hijjah and the appointed Days of Tashriq. Dhikr is thus ordained during all the thirteen days; starting from the 1st day of Dhul-Hijjah to the 13th day. They are all days of Dhikr, Takbir (saying: “Allahu Akbar [Allah is the Greatest]”), and Tahlil (saying: “La ilaha illa Allah [There is no god except Allah]”). It is ordained that Muslims pronounce Takbir and Tahlil during these thirteen days at all times and wherever they may be. Allah (Exalted be He) says: And remember Allâh during the appointed Days. But whosoever hastens to leave in two days i.e. there is no sin on whosoever leaves on the 12th of Dhul-Hijjah, …and whosoever stays on i.e. for the 13th of Dhul-Hijjah …there is no sin on him, if his aim is to do good and obey Allâh (fear Him), and know that you will surely be gathered unto Him. Allah (Glorified be He) reminds pilgrims that as they gather in `Arafat, Muzdalifah, and Mina; He (Exalted be He) will assemble them all in the Day of Resurrection in a large gathering as He (Exalted be He) says: (And remember) the Day when He will gather you (all) on the Day of Gathering, — that will be the Day of mutual loss and gain (i.e. loss for the disbelievers as they will enter the Hell-fire and gain for the believers as they will enter Paradise). All people will be gathered on the Day of Resurrection and reckoned for their deeds. If their deeds are good, they will be rewarded and vice versa. The large gathering at Mina, `Arafat, and Muzdalifah reminds reflective people of the Day of Resurrection so that they may prepare for this great Day. However, some pilgrims may be in need to hasten and leave Mina on the 12th of Dhul-Hijjah and some may not. Whoever hastens and leaves Mina on the 12th of Dhul-Hijjah after throwing the stones after Zawal (midday), there is no blame on them. Whoever leaves Mina on the 13th of Dhul-Hijjah after throwing the stones after Zawal (midday), there is no blame on them and it is best as this was done by the Prophet (peace be upon him). 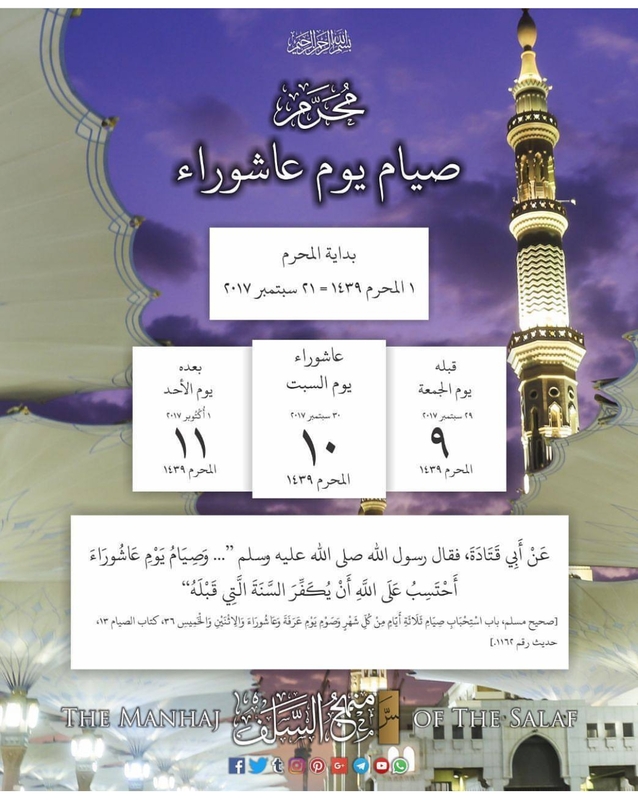 Thus it is optional either to leave Mina on the 12th or the 13th of Dhul-Hijjah. Pilgrims then proceed to Makkah where they are to perform Tawaf-ul-Wada` (circumambulation of the Ka`bah on leaving Makkah) if they are leaving or they may stay in Makkah for some days. A pilgrim must perform Tawaf-ul-Wada` whenever they intend to depart. It should be clear that the Day of `Eid-ul-Adha is not one of the Days of Tashriq as some people wrongly think; they leave Mina on the 11th of Dhul-Hijjah and say that this is the second Day of Tashriq. This is a big mistake for the Prophet (peace be upon him) said: Days of Mina are three. Whosoever hastens to leave in two days, there is no sin on them and whosoever stays on, there is no sin on them. i.e. the 11th, the 12th, and the 13th Days of Dhul-Hijjah. 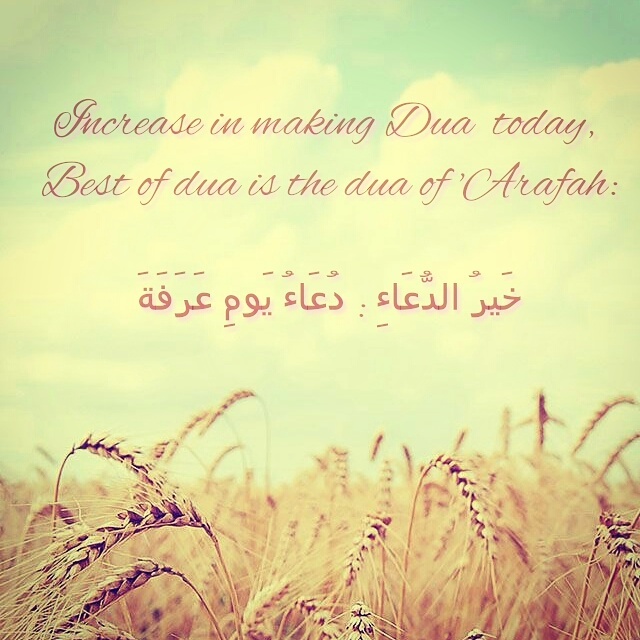 Increase in making Dua Today! ! The Messenger of Allaah (Sallallaahu ‘alayhi wasallam) was asked about fasting on the Day of ‘Arafaah. He said, “It expiates for the sins of the previous year and of the coming year.” Narrated by Muslim.